Nestled among the trees and offering free Wi-Fi and an outdoor pool Whispering Woods Hotel Conference Center is an amenity-rich choice for guests visiting the Memphis area. 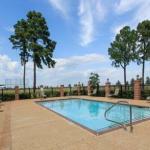 Set among 175 acres of woods the four-story Whispering Woods boasts 181 rooms all featuring free Wi-Fi and cable TV. Breakfast is free each morning and the in-house restaurant sells salads and sandwiches in the evenings. Active guests take advantage of the on-site jogging track and outdoor pool. Work-friendly amenities include a business center copy service and conference facilities. Pets are permitted for an additional fee. Parking is free. You'll find several local restaurants within five miles of Whispering Woods and golf is less than eight miles away at the Wedgewood Golf Course. Elvis fans make the 18-mile trek to Graceland. The music of Beale Street in Memphis is about 26 miles from the hotel and Memphis International Airport is 16 miles away.